This delightful Chamilia gift set features a 7.5" sterling silver bracelet with an oval snap clasp, and hearts & vines charm. This enchanting charm features an intricately cut-out design depicting a heart surrounded by twisting vines. 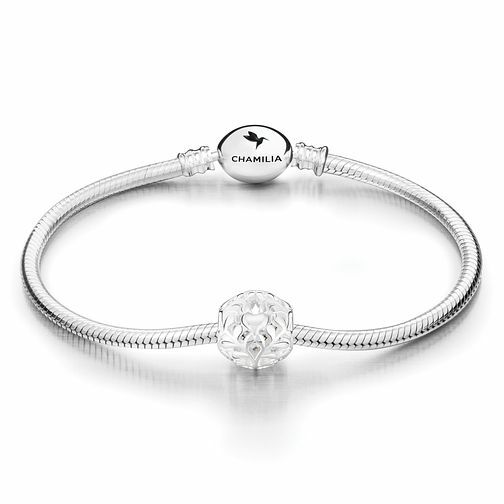 A timeless charm, the perfect way to start off a Chamilia collection, this set comes presented in a Chamilia gift box. Chamilia Sterling Silver Hearts & Vines Gift Set is rated 5.0 out of 5 by 7. Rated 5 out of 5 by Anonymous from Fast delivery The bracelet and charm are beautiful . The price was fantastic and my daughter loves it . Rated 5 out of 5 by Anonymous from Stunning The hearts and vines bracelet is stunning. Recieved a day early in lovely packaging. It is of top quality very shiny and stunning. Biught for my mum for mothers day im sure she will love it. Added bonus got charm with it and for the price i paid fantastic.